You came here for a crash course on landing page usability. And today, you’ll learn 3 simple checks for auditing usability on your landing pages. Let’s dive in with a definition of the topic at hand. So, how does usability add to the mix when it comes to driving action? Usability design features help convey the benefits of what you’re offering. Making concepts easy to digest. Making content accessible to all visitors. You have an offer. Let’s say a white paper on the latest cloud report trends. And while landing page messaging (the actual page content) tells users the benefits of downloading – how you present that content is where usability enters the game. Now you know how usability fits into the landing page audit process. So let’s move onto the 3-point checklist. But we’re not done yet. Keep reading. Because I’ll show you how we put these techniques to work at Pagezii using one of our own landing pages. This usability check analyzes the amount of content found on a landing page. Now don’t get me wrong – it’s good to detail the benefits of your offer. But you have to draw a line. Because too much landing page content can steer visitors away from the desired action. This landing page holds about 400 words. Which is a perfect length to drive home the main features of the offer. This is different from, say, your blog posts. Which could be +1,000 word-pieces. And that’s perfectly fine for a blog post. Because they’re designed to share knowledge and converse with visitors. But back to landing page content. Aim for a landing page between the 400 – 600-word mark. This is just enough content to describe your benefits without losing focus. This next landing page usability check is about making key features and benefits crystal clear. The idea behind concise points is to make content easy to skim. And the best way to do this is to make use of good old fashioned bullet points. You can see we list items that highlight what visitors can have if they download. This is a key usability feature for visitors quickly scanning the page. Because some visitors may not want or have time to read all page copy. So, with these concise points, they’re eyes will focus on this section of the page, which packs a ton of information. Viausl breaks are how you use images and other nonwritten forms of content on your landing pages. From a usability standpoint, these visual breaks lower the cognitive load for visitors. Because they convey a concept in a simple format. I’ve highlighted the visual breaks in green. And you can see that each conveys our page messaging in different ways. Document Format Icons – visitors wondering what they’re actually downloading can instantly recognize the file types. Download Preview Image – We show a few images of the actual download contents. This gives visitors an idea of what they can expect. Target User / Expertise Image – A visitor scanning the page wondering if this is what they’re looking for can see if they are the ideal reader. 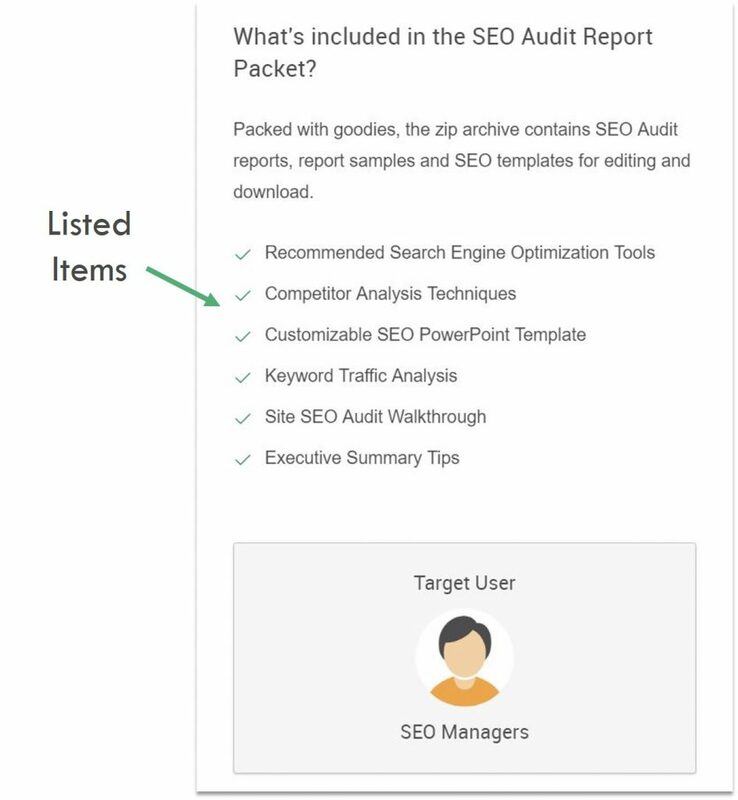 SEO Tools Image – Shows visitors the tools they’ll learn about in the download. All of these images drive home benefits and assist in driving action. Usability is a key aspect when auditing your landing pages. The revolve around landing page design, which aims to encourage action. 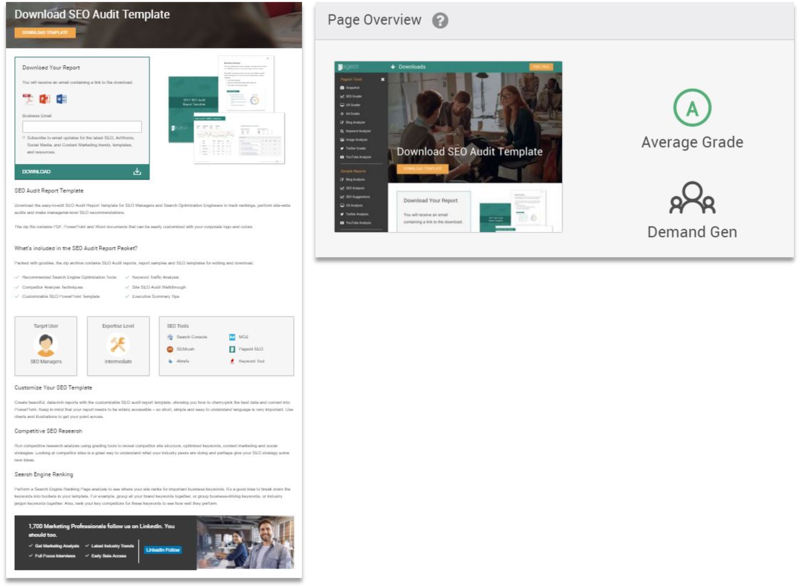 And with our 3-point landing page usability checklist, you can start optimizing landing pages to drive higher conversions. Want to test landing page usability for your own content? Then give our UX Grader Tool a test-drive. 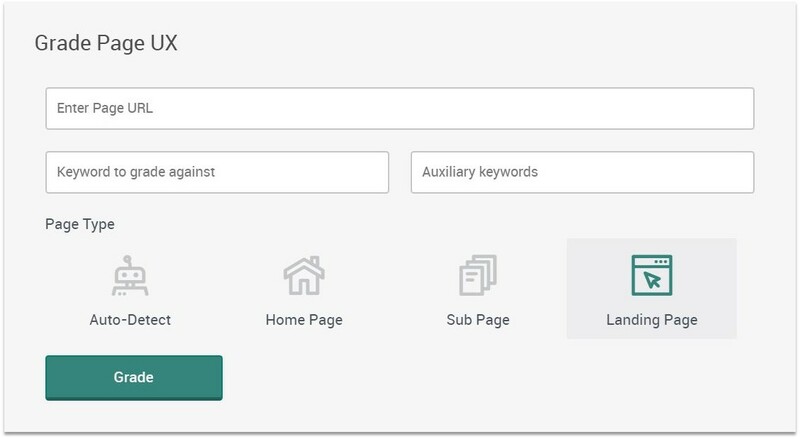 Simply enter a landing page URL, the target keywords, and set the tool to “landing page”, and see how you fare.